If you have been working with your toddler on potty training, you've probably both dealt with a good number of accidents. Accidents in potty training can be discouraging to both child and parent and may make the stretch from diapers seem wider than it really is. You may feel that you have lost progress when a child suddenly has an accident, but occasional potty training accidents are all part of the process. It may have nothing to do with the success of your technique, but may be the child's reaction to a relatively minor change, like a trip to a relative's house or a birthday party. When these accidents happen, there are few things to keep in mind. As with many other challenges in child rearing, a positive attitude is the best weapon against potty training accidents. Try to remove the emphasis from the potty training accident itself and place it on making more progress and remembering successes. Positive feedback is a much more important tool than making negative statements. Celebrating another dry night is more effective than reminding the child he keeps wetting himself. If potty training accidents start happening frequently, look to external factors to try and diagnose the situation. Your child may have a medical issue like a urinary tract infection or constipation. Remember, he may not have the words to try explain what's happening or what he feels. He may be putting off going to the toilet because he does not know how to deal with an unfamiliar condition. Another common reason for regression is the arrival of a sibling. Many couples these days choose to space their kids by about two years. Of course, two is primo potty training time, and you may see a surge in potty training accidents upon the arrival of a newcomer who is suddenly absorbing all parental attention. Respond to this situation with understanding. Remain firm about your shared goals for potty training, but take time to discuss what's going on and give your child a chance to talk about his thoughts. 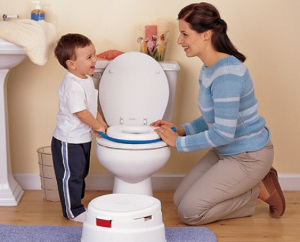 Potty Training Tips Online provides articles and information on Potty Training for new parents. Great free help, links and more.